Greg Lewis' thoughtful, theatrical and, occasionally humorous approach to the music of Thelonious Monk, results in a thoroughly enjoyable album. So, Thelonious Monk, a Numbian prince, and a Hammond B3 Organ walk into a bar…it’s a terrible set up for a joke, but a wonderful concept for an album. 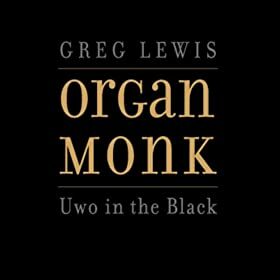 Uwo in the Black is the second CD in organist Greg Lewis’ Organ Monk series, (Uwo being the number two in Nubian Dialect). Building on the success of his 2010 debut Organ Monk, Uwo in the Black features Lewis playing some more obscure Monk tunes along with his own original compositions. His thoughtful, theatrical and, occasionally humorous approach to the music, results in a thoroughly enjoyable album. While having studied piano with jazz gurus like Jaki Byard and Gil Coggins, Lewis is self-taught on the Organ- citing not only jazz organists like Larry Young as influences, but also the Family Stone’s Roger Smith, as well as, gospel organists he heard growing up in Queens. From the screaming intro of the opening track (Monk’s “Little Rootie Tootie”), it is clear that Lewis understands the dramatic, timbral and dynamic possibilities of the organ. This is particularly evident on the track “Crepuscule With Nellie”; where Lewis’ hands and feet transform Monk’s solo piano meditation for his wife, into a cathartic afterhours teardown. There are other great lesser-played Monk tunes on the album including “Ugly Beauty”, “Humph”, and “Stuffy Turkey”. Particularly outstanding is the tune “Skippy”. By looping the descending figure found at the end of the melody, Lewis creates a tilt-a-whirl-gone wrong intro, before launching into Monk’s wickedly angular melody with guitarist Ron Jackson. Uwo in the Black offers up a number of interesting originals. Including dramatic pieces like “Why Not”, which finds drummer Nasheet Waits and Lewis crashing from side to side. The highlight of the album is “In The Black-My Nephew” where Lewis, Jackson, Waits and saxophonist Reginald R. Woods, build a simple five-note ascending motif, into a six and a half minute tidal wave of sound.